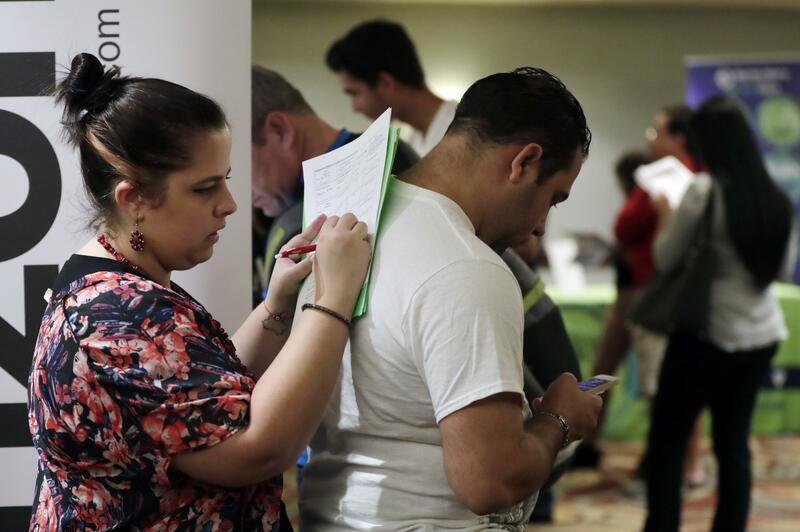 WASHINGTON – U.S. employers sharply ramped up their demand for workers in January, advertising 6.3 million jobs at the end of the month, the most on records dating back 17 years. The number of job opening soared 645,000 in January, the Labor Department said Friday, the largest one-month increase in 2 1/2 years. The number of people hired ticked up and fewer Americans quit in January compared with the previous month. The huge demand for workers comes as the unemployment rate is already at a 17-year low of 4.1 percent. The report shows that overall hiring increased by a much smaller amount than job openings, suggesting that employers are having difficulty finding the workers they need. That may raise pressure on companies to increase pay in the coming months to attract more applicants. The data could fuel debates about whether a “skills gap” has made it harder for companies to fill open positions. Business groups argue that many jobs, particularly in manufacturing, administrative work and information technology, require greater or different skill sets than in the past, and not enough workers have them. Some economists respond that businesses should offer higher wages if they are truly desperate for more employees. Americans’ paychecks have picked up a bit in recent years, but by most measures the gains are still sluggish compared with previous periods when the unemployment rate was this low. The report, known as the Job Openings and Labor Turnover survey, or JOLTS, shows that job openings surged nearly 16 percent in January compared with a year earlier. Yet the number of jobs getting filled rose just 2.3 percent, to 5.6 million in January. In a study released this week, Burning Glass, a labor market analytics firm, finds that skills gaps exist in some specific occupations and industries, but for different reasons. In information technology, for example, there are 17 percent more jobs open than there are available workers, Burning Glass calculates. That’s partly because demand in relatively new fields, such as cybersecurity and “big data” analysis, have exploded in recent years. Meanwhile, training programs have been slow to ramp up and teach the new, complex skills needed. Many of those jobs also combine certain skills, such as software development and business analysis skills. Training for such “hybrid jobs” is more complicated and less available than for more straightforward jobs, Burning Glass’ report said. The U.S. Chamber of Commerce sponsored Burning Glass’s research. In other cases, employers are undercutting their own efforts. In office and administrative work, there are 5 percent more jobs open than qualified workers, Burning Glass found. But many employers increasingly demand four-year college degrees for those jobs, narrowing the number of prospective applicants. For example, 37 percent of job postings for bookkeepers require a college degree, the study said, but just 19 percent of those who currently work as bookkeepers actually have them. This so-called “upskilling” accelerated during the slow recovery from the Great Recession, when employers had a much broader pool of workers to choose from. But with the unemployment rate possibly dropping below 4 percent in the coming months, businesses may have to take a more flexible approach. Published: March 16, 2018, 8:48 a.m. Updated: March 16, 2018, 2:29 p.m. Tags: job openings, Labor Department, record high, U.S.